There’s a wise saying: “don’t spend dollar time on penny tasks.” Shopify merchants are beginning to wake up to the fact that there’s a much faster, easier, and cheaper way to manage their financial reporting and inventory. And the secret is Shopify Quickbooks integration. This sleek automation gives you more time to devote to those “dollar-time” business activities (like marketing and sales… the very driving force of any business). And it’s saving Shopify store owners loads of money on fixing would-be financial reporting and inventory errors. And I’m here to share it with you, step-by-step, so you can enjoy stress-free accounting. So… to begin, there’s a quick setup option that makes e-commerce financial reporting with Shopify simple and streamlined. This is the juice that automates your Shopify store’s entire accounting process. If you’re like most merchants and looking to eliminate the frustration of manually tracking your Shopify payouts (but still want to have your financials in order for the feds! ), this tutorial was tailor-made for you. Once you connect the two by using the Shopify Quickbooks Online integration, you’ll be able to automatically export Shopify to Quickbooks. Now, if you’re not familiar with Quickbooks, just know that it’s easy for small business owners to use, yet it remains the gold standard that professional accountants swear by. There really is no comparison. And in case you’re curious… this tutorial works for Quickbooks Desktop, too. Step 1: Sign up for Intuit Quickbooks Online. They offer a free 30-day trial option which will suit your needs for now. Alternatively, you can purchase Quickbooks Desktop, but this is pricey software ($200) that you’ll have to download to your computer. Quickbooks Online, on the other hand, is instant and generally offers all of the features a Shopify merchant could possibly want. Once your account is created, you’re ready to move on to step 2. Step 3: Add the Flowify app to your Shopify store. Download here for a free 7-day trial. You can also find it from inside your Shopify Admin area. Simply select Apps in the left sidebar, and then type ‘Flowify’ in the search bar. And voilà! Step 4: Once inside the Flowify app, just follow the simple instructions to connect it to your Quickbooks account. Easy peezy. Step 5: Flowify will then guide you step-by-step to ensure everything is set up properly. Each transaction will now match exactly to your Shopify deposits. Now you can reconcile your bank account in record time! Pretty neat, eh? Step 6: Sit back and relax as Flowify updates let you know everything is working as it should. Your Shopify business is really becoming a well-oiled machine. Keep it up! That’s it! With Flowify, you just plug it in and cue the compliments. It’s quite impressive to see your company’s records and inventory neatly organized. Your SKUs and transactions matching, your books updating in real time, and no redundant errors to correct. And you won’t have to pay an accountant to load it all manually into Quickbooks (and fix your mistakes! ), which will likely save you a ton of money. Sorry accountant. You’re welcome, wallet. Buy yourself something nice. Better yet, reinvest in your marketing. After all, this is your year to dominate the competition, right? Remember, every successful business is built on smart systems. This setup allows for the rapid growth that Flowify users are already experiencing. Smart integrations like these put you in good company, with 5.6 million other Quickbooks users to be exact. Now that your two greatest assets — your time and your talents — are freed up from “penny tasks” like accounting, you can set your sights on growing your customer base and providing top-notch customer service. 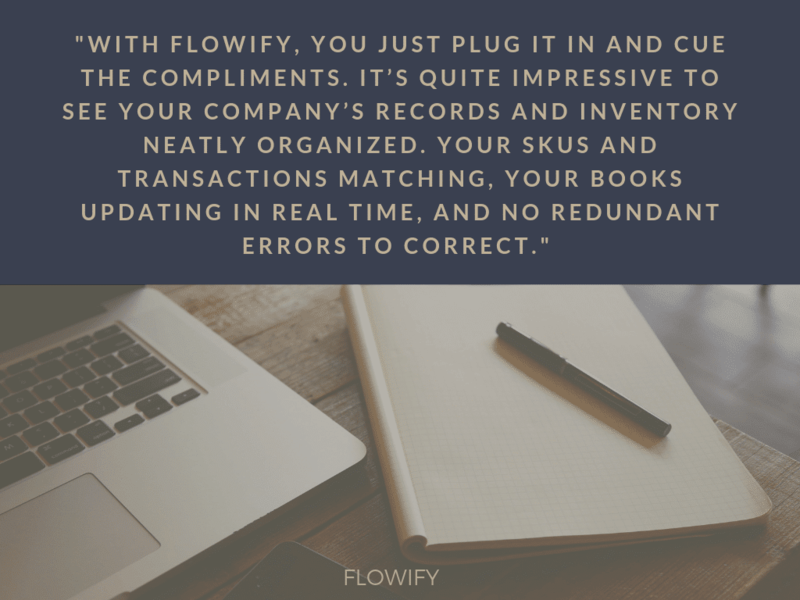 Flowify integrates Quickbooks and Shopify with ease and elegance to completely automate Shopify sales tracking, inventory, refunds, processing fees, bank deposits, and more. Not to mention you’ll have organized and up-to-date business financials. Get started today and see how a support team of accountants and bookkeepers can help you to better manage your Shopify store accounting.